A clash of Big Ten powerhouses takes place Tuesday in Madison when the No. 20 Wisconsin Badgers host the No. 11 Michigan State Spartans at 7 p.m. ET. The Spartans (19-5) come to the Kohl Center at 10-3 in the Big Ten, one game behind Michigan, while the Badgers (17-7) are 9-4 and in the hunt. This massive Big Ten showdown has seen plenty of line movement, with the game opening at pick'em before moving to Michigan State -1.5. The over-under for total points has jumped from an opening line of 131.5 all the way to 136. Before making any Michigan State vs. Wisconsin picks of your own, check out the latest college basketball predictions from SportsLine's proven computer model. This model, which simulates every game 10,000 times, has raked in the winnings for those following its picks. During the past two years, the SportsLine Projection Model has returned more than $5,200 to $100 players on its top-rated college basketball picks. 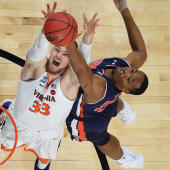 It also entered Week 14 of the 2018-19 college basketball season on a blistering 90-58 run on top-rated college basketball picks against the spread. Anyone who has followed it is way up. Now, the model has simulated Michigan State vs. Wisconsin 10,000 times. We can tell you it's leaning over, and it also says one side of the spread hits in over 60 percent of simulations. You can see that pick only at SportsLine. The model has taken into account the Spartans' rebound from an inexplicable three-game losing streak against seemingly lesser competition. They blew out Minnesota 79-55 on Friday to snap the skid. Before the losing stretch, MSU had won 13 in a row. The key to success has been on the offensive end. The Spartans are averaging 81.9 points and are 14-2 on the season when managing at least 78. Wisconsin is known for its defensive pressure, but when the Spartans face teams that allow under 67 points, they're 7-2 against the spread. But just because the Spartans appear back on track doesn't mean they'll cover the Michigan State vs. Wisconsin spread on Tuesday. The Badgers have won and covered six of their seven games, led by a defense that allows just 61 points per game, 10th fewest in the nation. The Badgers are 9-2 at home, where they've been underdog just once. They also shot 49 percent and rolled No. 2 Michigan 64-54 (at +3.5) on Jan. 19. Forward Ethan Happ is averaging 18.3 points and 10.5 rebounds, ranking in the top five in the Big Ten in both categories. He poured in 19.3 points per game in three matchups with the Spartans last season. Wisconsin has covered in five of its past seven meetings with MSU. Who wins Michigan State vs. Wisconsin? And which side of the spread cashes in over 60 percent of simulations? Visit SportsLine now to find out which side of the Michigan State vs. Wisconsin spread you should be all over, all from the model that has returned more than $5,000 to $100 players the last two years.